trike. But don’t worry...max speed in reverse is 2 mph. 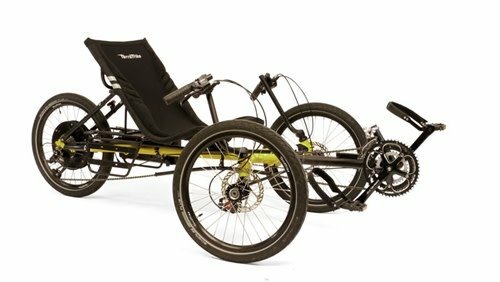 And, not only will this trike back up, but it can also help you out if you forget to downshift. Let’s say that you are riding along enjoying the scenery so much that you neglected to shift into a lower gear before coming to a stop. Or maybe you need to stop halfway up a hill. We all know how diffictult it can be to begin to pedal uphill in the wrong gear. The Wired Plus Minus takes care of that with the “crawl” feature. Just as you pushed and held the minus button to crawl backward for reverse gear, you push and hold the plus button to go forward. 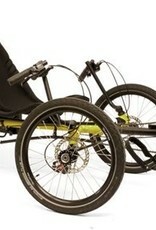 It too is limited to 2 mph, and is merely intended to get the trike rolling so that you can begin your pedal stroke. After it starts to move, and you start to pedal, you can let go of the plus button and the motor assist will kick in as appropriate.